The focus was firmly on our region’s youth services yesterday when they were both set up for a bright future and recognized for great work already done. Swan Hill Rural City Council was announced as one of five councils across the state to share in $2.5 million funding from the State Government’s Youth Empower Program. Council will use the funding to deliver projects to support young people in Swan Hill, Lake Boga, Robinvale and Nyah to achieve their education and employment goals. Mayor Les McPhee said the funding meant big things for Council’s Youth Support Program. “We have such a unique situation in our region, with a large number of smaller outlying towns that don’t have direct access to youth services,” Cr McPhee said. 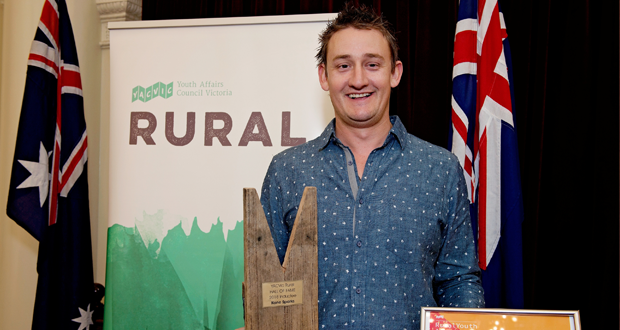 The funding announcement was made at the inaugural Youth Affairs Council Victoria Rural Youth Awards, where Council’s own Youth Support Co-ordinator Kane Sparks was the first ever inductee to their Hall of Fame. Kane was selected for his long standing and dedicated service to the youth sector and the impact he’s had on young people in our community. “Kane has been working with the youth of our region for 10 years and is a worthy recipient. Congratulations Kane,” Cr McPhee said. “I’d also like to congratulate NOVO Youth Council members Hana Roberts and Tiana Sixsmith who were named as finalists in the Young People Leading Change in Rural or Regional Victoria category.